Battle of the Books is an after school club open to 5th and 6th grade students in Catholic schools throughout the Diocese of Arlington. The All Saints club meets every other Monday after school in the library. An assigned book is discussed in detail each meeting and two books are reviewed monthly. There are 15 books on this year’s list representing different genres of literature. 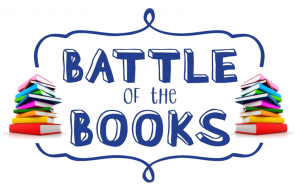 In May, the diocesan Battle of the Books competition takes place, where each school is represented by a team of five students. The Battle of the Books program is challenging and fun for students who enjoy reading books and competition. Please contact Mrs. Coyle for additional information about the Battle of the Books. Categories include nonfiction, historical fiction, fantasy, classic, mystery, adventure, realistic fiction and Catholic Librarian Association (CLA) choice. Note: Please be aware due to pace of the meetings and inclement weather the book discussions may vary but we will try to adhere to this schedule in reading order.